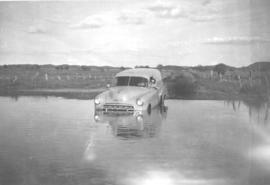 A car (probably a Chevrolet) is stuck on a flooded road in Mexico. Not found in CM. 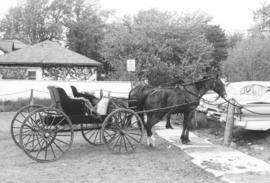 A contrast in lifestyles with cars parked on one side of an Elmira hitching post and horses and buggies parked on the other side. Not found in CM. 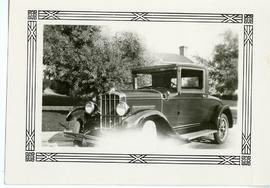 A motor car and tractor likely of 1920 vintage but unsure. Not found in CM. Related photos and article in CM 5-28-11. 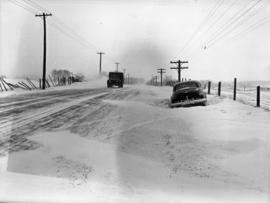 A sheep drive near Cache Creek, British Columbia. 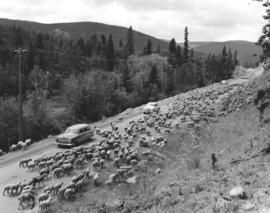 A sheep drive near Cache Creek, British Columbia. Not found in CM. Used in CM 4-7-5. A truck overturned by floodwaters in the Yuba City area. MDS workers worked there to alleviate the devastation caused by heavy flooding. Cf. 1994-14.1181. 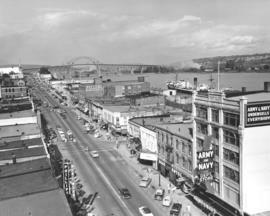 A view of a main street in New Westminster, British Columbia with two bridges in the background crossing the Fraser River. Not found in CM. 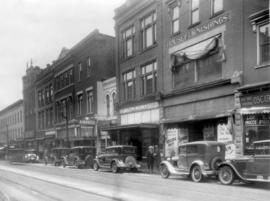 A view of the north side of King St. somewhere between Queen St. and Frederick St. with various automobiles parked along the street. Used in Hannes Schneider, p. 120G. Related sketching in file 1994-1.45.